There’s lots to think about when choosing a course – but what actually happens once you’ve booked your space and made it to resort? Izzy from our Courchevel 2015/16 residential course outlines a typical day in the life of a trainee ski instructor. 8:15am – Every morning starts with the smell of bacon and eggs or some other delicious cooked breakfast (think omelettes, pancakes, smoked salmon and eggs on toast) and the choice of breads, cereals and porridge too that your hosts will cook up for you. 9am – Grab your skis, poles and boots from the boot room downstairs and head out to get the 10 minute free bus from Le Praz up to Courchevel 1650. 9:15am – Meet your instructor outside the New Generation office, or if you’re lucky you can sneak in a quick coffee from the cafe next door and have a team meeting with a rundown of the week’s lessons! Every day starts with a group warm up and stretch, which you all get the chance to lead if you want to. Some examples of these include wheelbarrow races (much harder than you think in ski boots! ), relay races and even duck duck goose. 9:30am – Skiing begins with some warm up exercises on your skis to help you with balance and posture. These can range from tapping your skis, to hopping from foot to foot, to full on one legged skiing. Your instructor will take you on some easy warm up runs too to get your legs going before you start practising your techniques. 10-1:30pm – Your BASI Level 1 and 2 exams are split into two parts; teaching and technical, so training is split into practising both. Teaching is literally just that – running a mock lesson as if you were an instructor while your group all pretends to be the beginners you’re teaching. The tech is split into several more sections where you will focus on short turns, long turns and central theme (introductory activities on skis right up to parallel turns). Your lessons are focussed around getting you familiar and comfortable with everything that you need to know. At the end of the day you are there to have fun and do what you love, skiing. 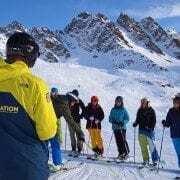 Your instructors know this too and training often has ‘blasts’ of skiing throughout the day to just go fast, play with some more difficult terrain and if there are large dumps of snow the night before than off piste powder skiing is the only activity on the agenda that day! 1:30pm- Lunch time, either on the slope with your packed lunch from the chalet hosts or treating yourself to one of the on slope restaurants or cafes at the bottom of the mountain. 2:30-4pm- Back onto the slopes either with your instructor or for your own practice. The course comes with a Three Valleys lift pass, which gives you so much more to explore and means on days or afternoons off you can ski over into Meribel or Val Thorens. 4-4:30pm – Time to head back to the chalet to kick off your boots and relax. If you’re not too tired there are activities such as fitness sessions, yoga and weekly French lessons. 7:30pm- Dinner time. Even better than the breakfasts! Either a starter and a main or a main and a desert. Dinners can be anything from pulled pork and potato wedges, to lasagne, to a full roast dinner. 9pm- Your evenings are yours to do what you like, whether its winding down after a long day on the slopes in the living room watching a film or popping to the lively pub next door to abuse the pool table and your liver. Courchevel has bands playing live music several times every week, amazing restaurants and lots of fun activities to amuse you on your days off with a luging track, bowling and an ice rink. The New Gen instructors and staff are all extremely welcoming, professional and encouraging and they helped me to have one of the best experiences of my life in Courchevel. Whatever you’re looking for, this course is an amazing opportunity to improve your skiing and have an incredible three months living in a ski resort with your friends while you do it! If you want to sign up for the adventure of a lifetime, simply request a brochure or book online today. You know you want to!